Two men were silently moving about the small fishing craft, a small battery-powered lantern secured to the stern their only light source. The dawn had yet to break and only the faint glow of Cleveland in the distance allowed the men to know they were close to home. "Jack, hand me that would ya?" one of the men said. Jack reached to the bottom of the boat and handed the other man the chain, the metallic noise of metal scraping on metal echoing through the silence, causing Jack to flinch at the sound. "You sure this is a good idea, Denny?" Jack asked. "Ah, ‘course it is," Denny replied, grabbing a wrench and attaching a bolt to the end of the chain. "You heard that fella at The Spot. Five grand for a photo. Ten grand for a Bessie tissue sample. Fifty for the corpse and a hundred for her alive." "I don’t get it," Jack said with fear in his voice. "Why would anyone want to capture her? What she ever do to anyone except nip at a few swimmers now and then? And what’s all that stuff with tissue samples? What good does that do anyone?" Denny shrugged. "Maybe they want to study her DNA or some stuff like that! Prove she’s a prehistoric creature, you know? Besides who cares? We’re gonna be rich!" Jack shrugged and took another swig from his flask. Denny concentrated on his task, finally attaching a large hook to the end of the chain. "Hand me the meat, Jack." Jack half turned in his seat and reached into a stained plastic cooler, pulling out a large package wrapped in white butcher’s paper. He handed the heavy bundle over to his partner who opened it to reveal a large cut of beef. "Meg’s gonna kill me when she finds out we took her roast. Family’s coming over next week for Bobby’s birthday and she was planning on making his favorite meal," Jack whined. "Hey, don’t sweat it," Denny grinned as he pushed the hook through the roast then doubled back and finally buried the hook deep inside. "After we get the bounty for Bessie, you can buy Bobby a dozen roasts for his birthday and Meg will treat you to some of that hot lovin’ you’ve been pinin’ for." 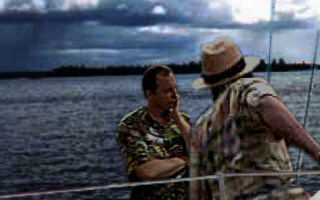 Jack sighed as Denny chuckle and made sure the other end of the chain was secured to the bolt in the bow of the boat. With a slight heave, he tossed the roast overboard. "There we go," Denny said with a satisfied smirk. "Come on Bessie baby, give us at least a look-see." He reached into a knapsack and pulled out a waterproof camera and looped the long strap around his neck. "Holy cow, Denny!" Jack exclaimed at the camera. "Where’d you get that? That musta cost a fortune." Denny nodded. "Sure did, but I hocked Pearl’s wedding set. Her finger’s been swollen lately so she’s been keepin’ them in her jewelry box. She won’t even know they’re gone and I’ll have them back before she knows it." "Oh boy," Jack said worriedly. "This ain’t good, Denny. Meg’s roast, Pearl’s rings. We’re gonna get in trouble, you just watch. We always do." Denny gave him a snort of derision and waved his hand. "Nah, we’ll be fine. Just you wait. That fella in The Spot’s gonna pay us good. I promise you." "Yeah if it’s not a scam," Jack muttered. He started to add more when suddenly there was a light jerk on the chain and a few links slid over the gunwale. "Denny?" Jack said, looking at the chain. Denny remained silent as a few more inches of chain slid overboard. "Denny? Is it her?" Jack asked. "Could be a catfish," he said. "Just takin’ a nibble." Suddenly the remaining length of chain began to play out in a blur. "Oh God," Jack cried as the chain sprang taut and jerked the boat around, knocking both off their seats and covering them in the lake bilge sloshing in the bottom of the boat. "Holy crap!" 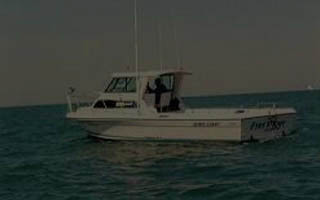 Denny yelled as the boat began to speed up, pulled along by the chain. "It’s a Nantucket sleigh ride, Jacky! Sure we didn’t catch a whale?" He was laughing madly as he tried to regain his seat and move the camera into position. "Oh God," Jack repeated over and over again as the boat continued to ride through the water, the bow digging deeply into the lake as the wake splashed over the sides into the boat. As quickly as it started the ride came to a stop, jerking the two men forward. Jack immediately grabbed a bait bucket and started tossing water overboard. Denny continued to fiddle with his camera. "Chain break?" Jack asked, not pausing in his bailing. "Dunno," Denny said, looking out over the water. He pulled gently on the chain. "Got slack," he finally said after pulling a few feet back on board, but jerked his hand back when he finally felt an answering tug. "Christ!" he exclaimed as the water in front of the boat started to bubble and roil. "She’s coming up!" he cried. "Oh God," Jack said, his face turning white as a huge elongated body lifted itself out of the water and rose before the boat. "Denny! That’s not Bessie!" Denny, the camera forgotten in his hands, simply watched with his mouth open as the huge shape leaned forward and began to fall toward them, crashing into the boat and pulling it and its passengers under the waves. Within moments, nothing remained of the boat or the men except a few ripples along the surface of Lake Erie. "More?" the uniformed, middle-aged waitress asked as she stopped across the counter from the brunette Slayer and held up a pot. Faith nodded her thanks and watched as her cup refilled with strong, black coffee. She upended the sugar container and watched as a stream of the white crystals poured into the cup. After an eternity she tilted it up, thought a moment and then added a bit extra. "Wow," a voice said from next to her. "Sure like your sugar, don’t you Sugar?" Faith turned to her neighbor on the next stool. After a moment’s assessment, she determined that the young man wearing jeans, cowboy boots and a flannel shirt was not a threat. "Got a high metabolism. Need the energy," she finally answered and lit her second cigarette of the morning. His smile grew even bigger. "I’ll bet. I’m John D. Walbanks, by the way. JD to my friends." Faith stuck the cigarette in her mouth and shook the offered hand. "Faith." "From your accent, Faith, I’d say you hailed from somewhere back East," he said. Faith looked at him a moment, a thoughtful look on her face. "Boston, originally. California. Now Cleveland." "Get around a lot, eh?" he said. "I can relate. Trucker myself. It’s lonely but I love traveling the road. What about you?" Faith shrugged as she sipped her coffee. "This and that." "On your way to Toledo?" "Look JD," Faith said, turning to the trucker. "I appreciate it, I really do, but thing is, I’m seeing someone." "Oh," JD said, the disappointment clear on his face. "That’s cool. I’m sorry if I was too obvious." "Nah, dude, don’t sweat it," Faith laughed. "Time was when I’d either screw ya or beat the crap out of you for even darin’. It’s this new thing I’m trying – serenity they call it. " JD laughed with her for a moment and then threw some bills on the counter. "Well, better get back to work. You take care, Faith and tell your fella he’s very lucky." "I will," Faith smiled and waved at the trucker as he left. She drained the last of her coffee and nodded to the waitress as she paid her bill. Faith shifted the motorcycle into the highest gear as she flew past a sign reading "Toledo City Limits." She heard a noise behind her and turned slightly on the bike’s seat letting off a muffled curse as she saw the flashing lights behind her. She swiveled her helmeted head a few times, as if looking for an escape route. With a sigh she signaled and downshifted the bike, bringing it off the highway and to a city street off the exit ramp. As the cop car pulled up behind her, Faith swung a leg over the bike and removed her helmet, securing it to the rear pannier. She dug out her wallet and handed the officer her license and registration as she approached toward his cruiser. "Thank you," he said, moving back to the car as his partner approached. "Moving along nicely, weren’t you?" the other officer said, taking a stance in front of Faith and crossing his arms. Faith reached into her pocket, pulling out a cigarette and lighting it. "Sorry officer," she said. "Just enjoyin’ the morning ride. Wasn’t even thinkin’, you know?" "Yeah," he replied. "It happens. And I can understand it with a bike like this. But you should be more careful. I don’t want to have to pick up the pieces of a nice girl like you scattered all over my highway." Faith gave him a ghost of a smile as she took a deep drag and watched as the other officer approached, a serious expression on his face. "So, Faith," he said. "Looks like you got a little unfinished business in California." "Is that a fact?" she told the officer. Under her breath she muttered, "Crap." She scratched her cheek nervously and asked them, "I got a phone call coming to me, right?" She gave the officers a teasing grin. One officer motioned for her to turn around by twirling his finger and Faith did so before putting her hands behind her. "Willow’s gonna kill me."